Circle-S has been providing industrial sandblasting and coating services in the Brazos valley for over 25 years. We are conveniently located just 5 minutes from Bryan, Texas on SH21 in the community of Kurten. Our equipment can handle any job, from large oil field machinery to smaller consumer jobs. We can strip, paint and coat just about any type of equipment or machinery. So give us a call today. 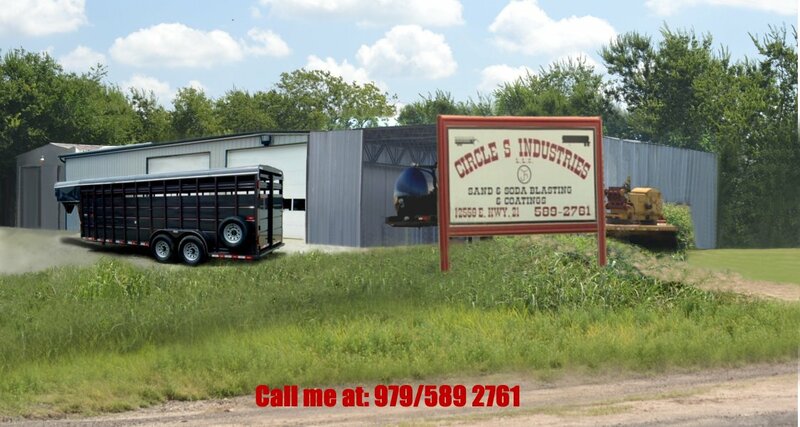 Circle-S Industries has been located at 12558 E. State HWY 21, in Bryan/College Station, TX for over 25 years. Even though we are actually located in the Kurten, TX community, Kurten is a suburb of Bryan, Texas located in the Brazos County of Central TX. We specialize in sandblasting which is a form of abrasive blasting using sand as a blasting media. There are other forms of blasting that use medias such as iron pellets, glass beading and walnut shells. Blasting can also be done with Sodium Bicarbonate or Baking Soda. Soda blasting allows for blasting even thin sheet metal leaving it uncontaminated and without damaging the surface. We specialize in refurbishing, coating and sealing industrial tanks. After stripping an industrial tank, our commercial customers sometimes want their tanks coated and sealed inside to resist, or stop, leaks and to improve their efficiency and life. Many coating and sealing formulas are available from polyurethane foam insulation to coatings that seal against mud salt and are acid resistant. Some formulas are designed to protect against abrasion, corrosion, impact, slipping vibration and may increase the life of a variety of industrial and commercial materials. We also do industrial painting. Traditional commercial paint is usually applied as enamel or polyurethane. We can blast paint tanks, industrial trucks, farm tractors, oil field equipment, horse trailers, gooseneck trailers, ranch gates and just about any other piece of equipment. However, we also apply powder coat paint. Powder coat painting is a form of dry powder painting where the dry paint is a media that is melted after being electro statically applied.